Invite your group to become birds. Let them climb, jump, spin, and fly around. Invite your group to become birds. Let them climb, jump, spin, and fly around. Like birds in springtime, choose to be happy, enjoy the sunshine, take long walks, and listen to the birds chirping in the trees. Transform your circle time area to make it look like a bird's nest. Glue illustrations on the floor. Add straw and small branches which you can assemble with "Mac-Tac". Discuss how a baby bird is born (hatching), how baby birds are fed, what they eat, how they learn to fly, how birds build their nest, etc. 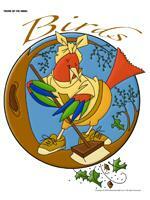 (Open activity sheet - Birds) Print and laminate. Children will enjoy guiding the bird towards its prey over and over again using a dry-erase marker. The pictures may be used as a memory game or to spark a conversation with the group. Use them to decorate the daycare or a specific thematic corner. 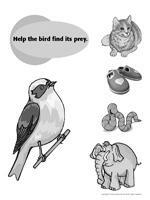 (Open picture game - Birds) Print, laminate, and store in a "Ziploc" bag or in your thematic bins. Ask a child a question and when he answers, the other children repeat his answer three times, like parrots. Place the illustrations from the picture game face down on the table. Have one child pick a card and hold it up so the other children can see it. The child asks his friends questions and tries to guess which bird is on the card he picked. However, the group can only answer "yes" or "no". Variation: If your group is very young, add illustrations of other animals and simply have children ask questions to determine if they picked a bird or not. Play music which contains singing birds. Invite children to imitate them. Give each child a feather. Place it in the palm of their hand. Ask them to blow on their feather to make it fly. Children sit in a circle. Each time you say, "The birds are flying", children crouch down and flap their wings. Give various instructions such as: "The dog is flying" or "Nobody moves". Children only move when you say, "The birds are flying". Choose a child to be the cat. The cat is very hungry so he chases all the birds around the daycare. Birds can look for a perch. Teach children to whistle. I can guarantee they will practice throughout the day! If you are really brave, a great way to practice is with crackers and snack time! This activity may be done over a short period of time. Decorate a box with your group. This box will be used to deposit mail delivered by the carrier pigeon throughout the theme. (Open model - Carrier pigeon) Print several copies and deposit them here and there within the daycare so children may colour one for another child in the group during free play periods. You can also ask children to suggest kind words they would like to send to a friend. Some examples are: kind, happy, smiling, adorable, beautiful, handsome, smart, charming, cute, gentle, great, etc. Give each child a string with tape at one end. Have them thread cereal on the string. Hang the necklaces in tree branches and watch the birds enjoy the snack! 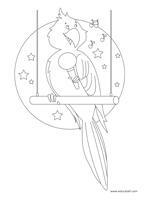 (Open craft - Bird mobile) Colour, cut out, and hang from a metal clothes hanger with fishing line. Blow up a balloon and knot the end. Cover the knot with a beak. Have children make feet and glue them under the balloon. Glue two small eyes and feathers on the balloon and have fun with your very own bird ball! Use two empty toilet paper rolls to make binoculars. Have children decorate them as they wish. Glue them side by side. Make two small holes on either side of the binoculars and thread a string through them. Children can wear their binoculars around their neck and use them to observe birds when you are outdoors. 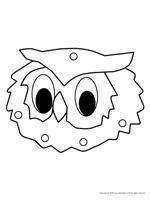 (Open coloring pages theme - Birds) Print a bird for each child and have them glue feathers to it. You can fly so high.